Team Porsche was expected to be one of the rabbits in the 83rd running of the 24 Hours of Le Mans this weekend, alongside reigning champions Audi Sport Team Joest. The LMP-1 factory hybrids have been there indeed as the event reached the halfway point, yet no one could have predicted that the Porsche 919 Hybrid leading at the time, would be the team with the least experience among the Weissach-based trio. Although current Formula One pilot Nico Hulkenberg, and grand touring sports car veterans Nick Tandy and Earl Bamber are by no means racing novices, one would not have anticipated that they would be the ones flying the flag in terms of possibly claiming the overall win. Yet, through a set of circumstances, they are leading the event with 12 hours left to run. Porsche’s No. 17 entry, which dominated the first six hours of the event, fell victim to an avoidable contact stop and hold penalty and are now a lap off the race lead in fourth overall. The team’s No. 18 machine, which claimed pole position on Wednesday, has had two separate dramas at the tricky Mulsanne corner in the last six hours. The first one saw Romain Dumas overshoot the braking point and make very light contact with the tire barrier, while the second saw Neel Jani spin and get stuck in the gravel trap. The latter incident cost the No. 18 two laps and they are now in sixth place overall. Audi meanwhile, has had pace from both its No. 7 and No. 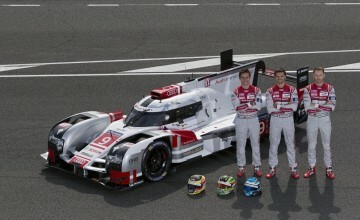 9 R18 E-Tron Quattros, but not enough within the last few hours, allowing the lead No. 19 Porsche to pit and maintain the lead without issue. 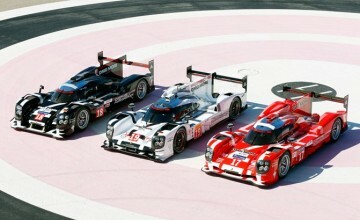 The lead between the 919 Hybrid and the N0. 9 Quattro was one minute at the time of press. The No. 7 Audi was right behind their sister entry in third. In LMP-2, the ORECA 05 demonstration race has continued to roll without issue as KC Motorsports Group holds almost a full lap edge on the other ORECA 05 coupe belonging to Thiriet by TDS Racing at the halfway point. The pace and durability so far from the relatively new marque has been impressive with Nicolas Lapierre posting a personal best 3:37.5 lap of the 8.45 mile Circuit de la Sarthe layout, a half second faster than the Hong Kong-based entry required to take the class pole position on Wednesday. Behind the lead duo, G-Drive Racing’s No. 26 Ligier continued to hold down the number three position, with the Murphy Prototypes open topped ORECA 03R running in fourth. A team though to watch out for in the event’s second half is the Gibson 015S entered by Jota Sport, last year’s Le Mans LMP-2 class winners. After falling back early due to mechanical issues, the British-based squad has quietly moved back into the top five at the midway point. While Jota has moved up, another early contender is out of the mix as Signature Alpine has retired after Paul-Loup Chatin made hard contact with the barriers at the Mulsanne Corner, which brought out the third safety car period of the race. In the grand touring ranks, the close racing that sports car fans have been accustomed at Le Mans from start to finish, continues to rage on as this article went to press. Prior to the start of a round of green flag pit stops, Corvette Racing’s Oliver Gavin had snatched the class lead from Aston Martin Racing’s Fernando Rees as the Vantage V8 pilot out broke himself at the Dunlop Chicane, but managed to stay out of the gravel trap. The battle in GTE-Pro has essentially become a four-car race with Corvette and Aston Martin being joined in the fight by AF Corse Ferrari in third and Porsche Team Manthey in fourth. The No. 99 AMR entry is the last hope for the squad as the team’s No. 97 “art car” was forced to abandon the race to due mechanical failure, which prevented driver Darren Turner from being able to limp back to the pit lane. Aston Martin’s fight in GTE-Amateur though, has not been nearly as taxing as the No. 98 machine has controlled the proceedings at the front throughout the opening 12 hours. 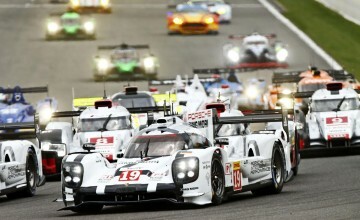 Prior to a regularly scheduled pit stop, Pedro Lamy held the lead over the SMP Ferrari 458 Italia of Viktor Shaytar in second and Marco Seefried in the Dempsey-Proton Porsche in third. Townsend Bell in the Scuderia Corsa Ferrari and Marc Miller in the Riley Motorsports rounded out the GTE-Am first five at the halfway point. Stay tuned to Rubbings Racing for our next update after 18 hours. Also follow @MattEmbury on Twitter for up to the minute reports.